Food, Yes Food is what propels Calcutta (I like the older names of illustrious cities). It’s not money, it’s not greed it’s not power. Landing in Calcutta is like shaking hands with an old friend. With my many voyages in the past and stays ranging from Hotel Lindsay, Lytton , Fairlawn (where part of City of Joy was shot and the cast stayed there) to The Park, The Oberoi Grand and this time at HHI. 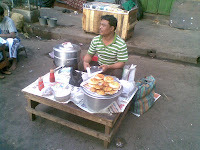 The predominant encouragement is the food and more often than not street food and affordable local exotica. So before boarding the flight I bought a book of short stories by Dipanwita Mukerjee called That Calcutta… Those Bongs. Allowing me to immerse in dreams of Illish, Gandharaaj lime, pithe, luchis and Patturi and of course Buro. Get eady.Calcutta looks like a city from the smoke stack era without the smokestacks, except of course if you are in Rajarhaat… you could feel you are in Gurgaon. My story is more about the smokestack Calcutta. 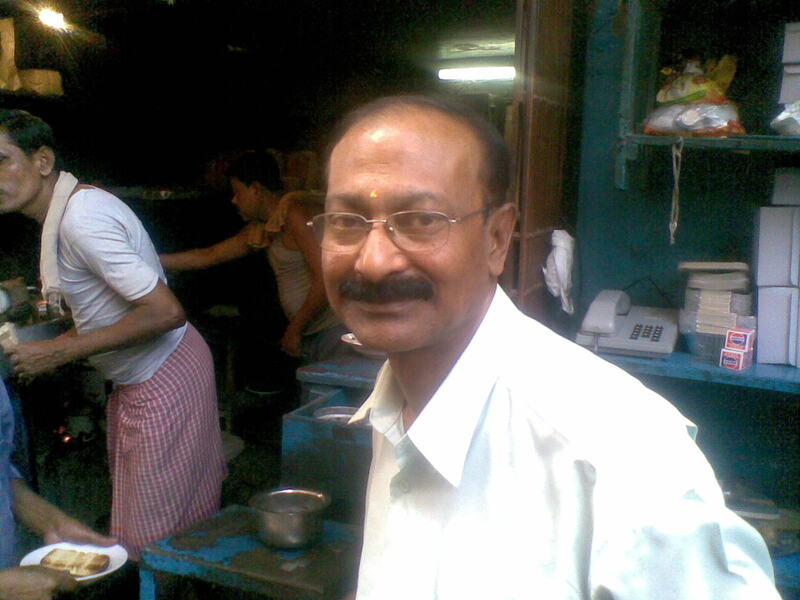 The choices were Shiraaz, Rahmania, Arsalan and a late entrant Royal came highly recommended by Sandip Ghose the high priest of food in Calcutta. The driver Alam knew where Royal at Chitpur road was located, however decided to go to Arsalan as it was already late for dinner. Arsalan (named after the animal the Lion) has Bihari ownership , launched in Calcutta in 2002 (makes it 8 years old), has made more than made a mark for itself in the gourmet’s heart. Imagine going past heavyweights like Shiraaz and Rahmaniya and the yet to be explored Royal. Alam the driver parked at the swanky Arsalan air conditioned et al. I said basic and the first one ever set up and we are at Arsalan at Park Circus. There is a festivity around the place, or is it madness or p erhaps mass hysteria, people at the cash counter behaving as if someone is distributing free food tickets in pre Prestroika Russia. We seat ourselves an old midget in a shirt and tie , Aziim takes our order. We are in Non Ac Hall. I believe that’s where the action is. On the right is a muslim Family having a conservative dinner .Further, three drunk Bengalis, one of them threatening Azim, food should be hot, muttion should be nice. Alam the driver joins us, Shantanu (my partner in crime)is a vegetarian today. We order a mutton biryani, a chicken biryani, a mutton champ, a vegetable biryani, a paneer dish, a dal and one roti. The Biryanis were flavorful but oily, with an enormous half potato, which was quite honestly bland. The expectation was greater than the delivery. The experience was nice. The food was anything but delicately flavored, I guess it’s the scale and volumes Arsalan deals with. 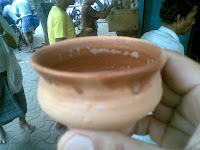 We chase it with small squat Thums Up , the cold cinnamon flavor hits the spot after a heavy mughlai meal. We paid Rs 440/- for this nearly enormous meal. Chitta Da: Differentaiated Snack at Dacres Lane : My friend and old colleague Sanjay Das promised to take me to Chitta da at Dacres lane while corresponding with me on this blog. Apoorva a current colleague made a similar promise. I also saw a segment on The Travel and Living Channel with the anchor a funny one, at Chitta da. 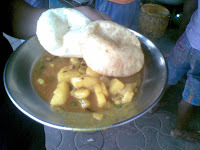 I had to go there, I began to think of the stew and toast in a pedestrian district more known for the magazine market and the surrounding Government offices, (usually called Bhabans, for Bhawans). We reached at mid morning at 11 am, and there was a row of patrons already imbibing the goodies. I asked the cook and server, what can you offer, fish finger, chicken stew and ghoogni (chick peas) all served with chunky toasts lightly buttered. We have the fish fingers nice chunky pieces of fresh fish in fingers like that of a goblin knotted and brown, umm but tasty inside with a light salad and mustard paste. I joked with Shantanu, Bengalis will just about anything with mustard. 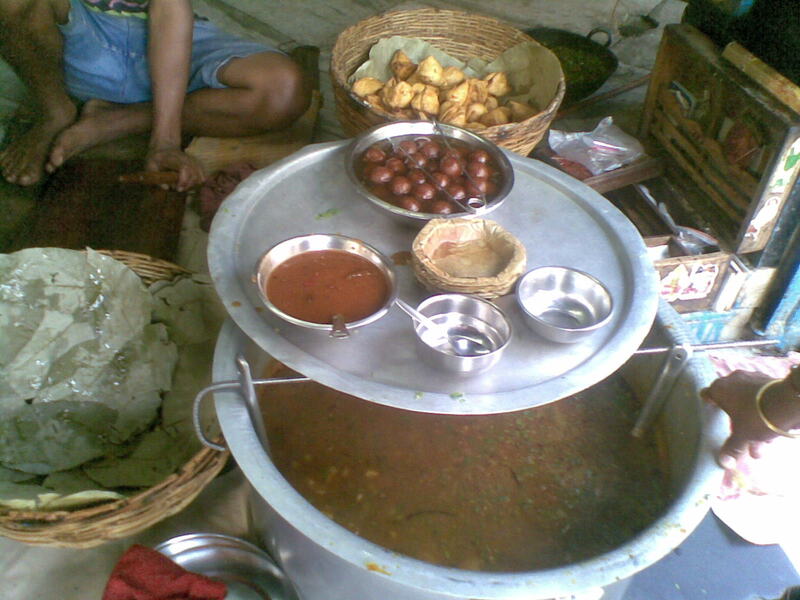 Next Ghoogni same format, delicious, it’s a channa curry with the same accompaniments. Now for the fried fish, a chunky piece of extremely fresh fish bite the crust into the odourless white flesh with the steam emanating. Oh yeah ! Followed, by tea as a beverage. Interesting format. We gave the chicken stew a pass, though it is the signature dish. Have to leave something for the next time. 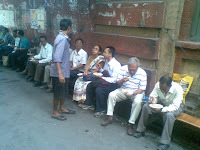 Now for the maths, this truly a salesman’s outing in the Tiffin Gali (Dacres Lane now called as Jimmy Hitch Sarani)and eaters paradise. Rs 27/- for the fish fingers, Rs 25/- for the fried fish, Rs 6/- for the Channa/ Ghugni and Rs 18/- for four coarse bread toast slightly buttered and three chais in kullar (earthen cup) for Rs 12/-. In all a wonderful snack for Rs 82/- That’s the owner now, probably Chitta Da’s son Nararayan Chandra Roy. Sudarshan Saha a colleague of, dearest Praveen, asked me, about the color of the walls, when I described my first visit to Suruchi in the 90s. Only an intense Bengali can ask about the hue and color of the walls when the subject under discussion is FOOD. Intense he is , and intense I am, he photographs and I eat and write. This was my se cond visit to Suruchi, I remember the last visit, where I perceived it as a widows and needy women NGO who could cook up some mean Bangla food. Now I know it’s the All Bengal Women Union, apart from all the activities they run this wonderful Bangla home food restaurant. There were four of us, two dyed in wool Bengalis ( Sudipto and Swarup), one semi dyed in wool Bengali (Shantanu) and one honorary Bengali (for the cuisine, Me) And yes, Sudarshan the walls were yellow. The place looked sleepy at ten past one with lights all off. Got seriously activated by half past one, with five groups of diners. We ordered four thalis with addons of Bhappa Ilish (steamed mustard Illish), bhekti paturi (steamed in a banana leaves and mustard), fried bhekti and a dish of a fish kofta and mocher jingha (shrimps cooked with banana flowers. Very nice, interesting and delicious. With waiter ladies called Didi and food brimming on our table. Even the dyed in wool Bengalis smiled, reminiscing of their days at Burdwaan and Nadiad. We, half dyed and honorary bongs relished the meal and gave it a Thumbs Up. I asked for the Gandharaaj Lime with newly acquired knowledge og Bangla food. The dyed wool colleagues were aghast and their jaws dropped. 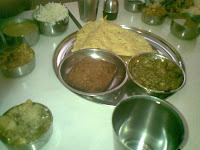 Lastly the misthti doi and pithes, more than pefect, Ate fish like fish (sorry its drink like fish) and the total bill with mineral water was Rs 735/- for all four of us and the Thalis were great as well with Dal, sukto, aloo bhaja. Nice, You have to be there. Erstwhile Chinatown, then leather town and now eating town, Tangra. I do not remember ever having go ne there during the day. It’s always been at night. With shadows lurking, strong smell of a tannery, a Chinese sauce factory (Sing Cheung Chinese sauces, oh, how much I want to buy the sauce brand as a business), smell of green chilli sauce and soy in the air mixed with overhanging gutter smell. It has the eerie feeling of the 70’s Bruce lee films with a mega restaurant named after his film Big Boss. The restaurants I have been to are Kimling, Chinahaus, Goden Joy and yet again Kimling many times. It does have the old world charm, it an old fashioned fare and approach to the whole experience. They actually put in bright fresh tomatoes in their Hot and Sour Soup. I love their unpretentious fried snacks. We ordered, chili garlic chicken a chili onion fish, prawn crackers, chicken wantons and some medium to large golden fried prawns (all fried you see) with their exotic green unbranded sauce. Chased with Director’ special Black for the honorary bong and Vodka a Gorbachow (yes spelt with W), for the half dyed in wool and full dyed in wool bong. The experience exhilarating, the food crisp and atmosphere ,a lot of fun with conversation and jokes with a bunch of guys on the neighboring table. 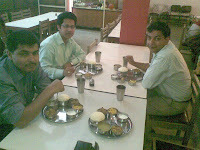 They were serious foodies and drinkers (Jaideep Raha, Tilak and Amit Bhatacharjee). 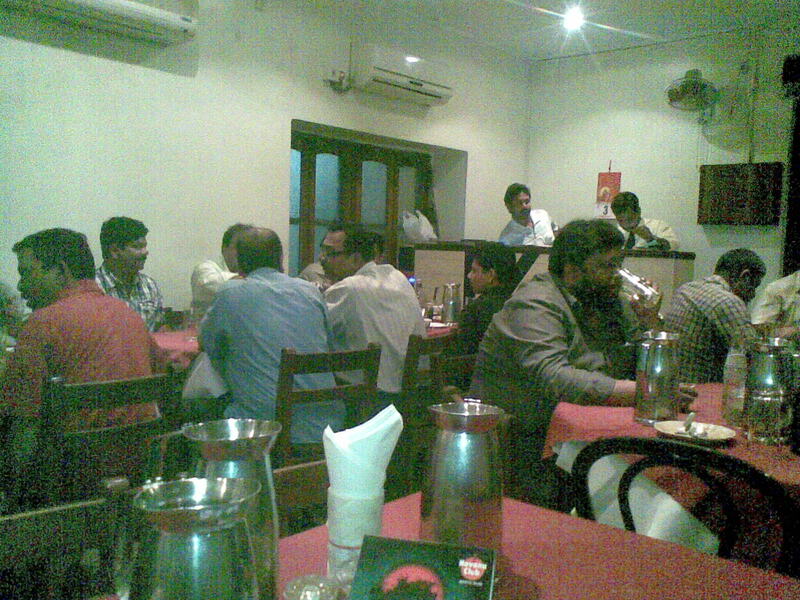 The whole evening a wholesome one with all sodas and mixers thrown in was Rs 1500/- Great Fun. A highly recommended place by Sudipto in tow with Shantanu c for breakfast, the Up bhaiyya influence fo r Kachoris, Samosas, Jalebis and Gulab Jamuns with Chai. The Kachoris, are more like slightly thick Puris. 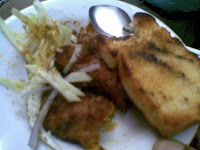 This the pucca khana (in other words fried food of Uttar Pradesh). It is a nice place, especially, the taste and the prices. Fits into precisely a salesman budget, four plates of Kachori, one samosa one jalebi, two chais all for Rs 45/- its on A C Bose Road close 85 Lansdowne (the designer boutique), near Gariahat. Finally, we did got to Terretty Bazaar on Sun yat Sen Road near the Old Lal Bazzar Police Stat ion for the morning Chinese breakfast market at Old Chinatown. 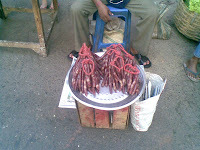 There were six odd stalls, selling, momos (dimsum), noodle soup and Chinese sausage. All made of mystery meat . I realized, I was not a complete convert to eat anything at anytime and for the first time I backed off with a timid hot cross chinese sweet bun to come back another day. I believe there is better action here on a Sunday. Loved the post as an ex Calcuttan. But would be enticing for a stranger too. 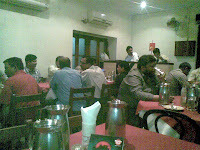 I've never eaten at Arsalan but I know that it is the choice of the new generation. The Chinese sauce company now sells the very Bengali mustard sauce, Kasundi, which is available at Bandra Mumbai now. I ate at Suruchi once just after I began working. I used to live in cal then and wondered what was the fuss all about. Would give my left arm to go there now. Your post evoked too many memories. I'll go to my local roll shop, hangla, to pick up dinner now. Thats a standing ovation for me especially coming from you. its very well written...i cant wait to go to chitta da..
while I was trying to tell Praveen I was a foodie...She mentioned about this blog...and truly fantastic it is! I've been to Calcutta once, and I simply fell in love with it. I've tasted nearly a dozen types of fish. Most of all I smoked through a clay bong, which was an amazing experience. I wish I can visit it again.